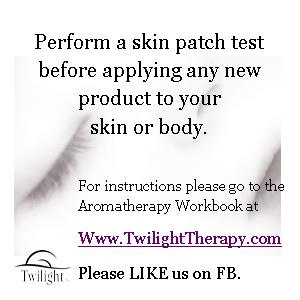 Whenever you begin using a new product on your skin we suggest performing a skin patch test. Apply the new product to a soft skin area such as your inner elbow or behind your ears. Wait 24 hours to see if any irritations occurs. Take into consideration that a percentage of the product will be absorbed into the skin and a percentage will evaporate. Apply a small amount of product to a soft skin area such as your inner elbow or behind your ear. Cover with a band-aid which will minimize the amount of evaporation into the air. When testing essential oils on your skin they must be blended into the product at the ratio that you are going to be applying. Since the essential oils are over 100 X ( or more) stronger than the plant from which they are obtained do not test them full strength on your skin because you will not be using them at full strength. Lavender, Tea Tree and Roman Chamomile are exceptions to the full strength rule since they can be applied neat (directly) to minor small skin conditions such as cuts, burns, blemishes,etc..